Spring time is here! And that means outdoor summer parties are around the corner! If you’re going to entertain in your yard, you’re going to have to turn it into an awesome space that can accommodate your friends & family. Here are some backyard design ideas that can help you get started. Before inviting your neighbors over, you’ll want to make sure that your yard is worth showing off. This may mean updating elements like your fence—or adding them if your yard is bare. Tall privacy fences create an intimate setting for enjoying spring and summer afternoons and evenings. Beautiful cedar and other bright woods produce a warm, secure ambiance that keeps the good vibes in and your nosy neighbors’ prying eyes out. Screening in an area on your patio area can provide additional protection from mosquitos, which might otherwise carry your pets or small children off in a swarming cloud. Screening is often affordable and is an easy home improvement project for even DIY novices. Installing screening before the mosquitos descend on us once more will allow you to maximize your yard time, letting you enjoy your space throughout the outdoor seasons. 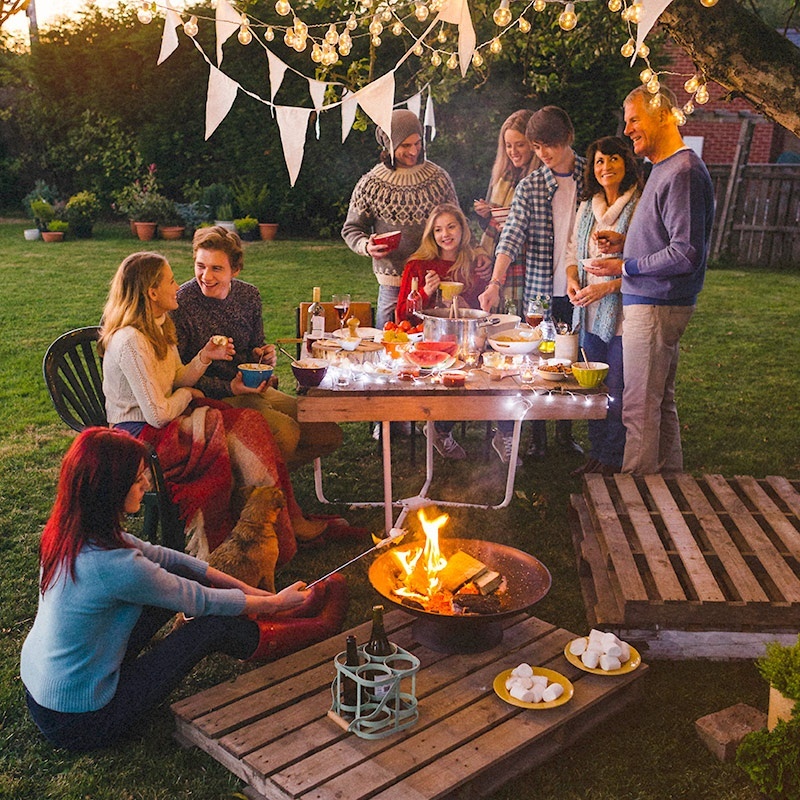 Your friends are also much more likely to agree to come to your summer barbecue if they know they’ll be safe from the itchy terror of dozens of mosquito bites! Good lighting becomes a necessity once the sun sets. However, the harsh light from your back door or flood light fixture can instantly kill the mood at your party or gathering. Lighting can be effective without being irritating. Outdoor floor lamps with soft colored, low-wattage bulbs cast a warm, inviting glow that won’t make your guests uncomfortable. You may also opt for the pleasant flicker of Tiki torches…or even a fire pit! The light from these sources works well with strong lights, sconces, or other temporary lighting sources. If your torches use oil as a fuel source, you can load them with a Citronella oil to effectively keep mosquitoes away. 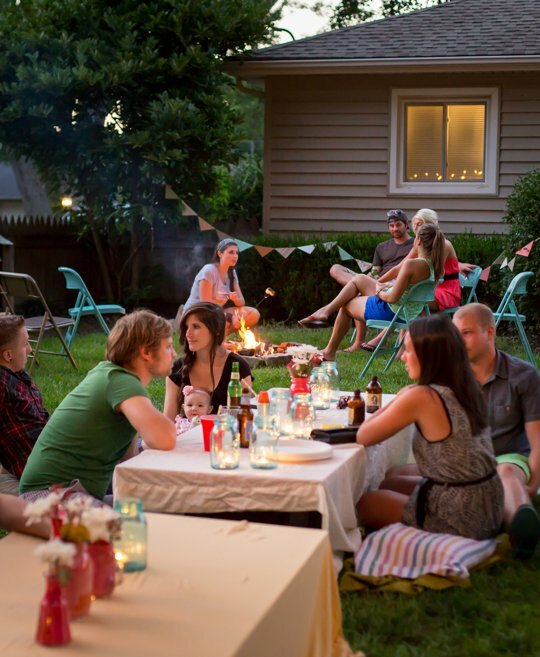 All successful outdoor parties provide people with a place to gather, and that’s what your yard should become too. A fire pit is one element that provides a convenient gathering place and will also be comforting on colder spring/summer nights. In addition to being a source of heat and light, you can use your fire pit to toast marshmallows for s’mores! A grill, on the other hand, allows you to barbecue more substantial food, and can be a focal point where everyone gathers to serve their plates of food with that special cookout taste we look forward to each summer. On warmer summer nights the space provided can expand by adding benches on your deck and/or patio that may serve as comfortable seating for having people come together yet give a space for freedom and fun activity. Privacy fences, lighting, seating, and other backyard design improvements all allow you to create a stylish, enticing atmosphere that has both form and function. There are an infinite number of ways to customize your yard for your preferred style of entertaining. Once you revamp your backyard, you can start showing off your new hangout spot by throwing the coolest (or warmest!) party on the block.